If you’re the kind of person that has a very eclectic taste in movies, there’s a high chance that there are two different sides to you. On the one hand, you just can’t get enough of Cher Horowitz and Clueless. After all, this ‘90s movie is soooo “rufus.” On the other hand, you also can’t say no to watching Blade Runner for the 2049th time. See what we did there? But what if we told you that you could mix these two loves within your own life? Well, it seems as though artificial intelligence is now coming for the fashion industry, and AI can now help you pick out what to wear. It seems as though Amazon is taking over the game when it comes to artificial intelligence. Millions of people across the globe have the Alexa in their homes, and it seems as though Jeff Bezos and his team are looking to expand this even further. In fact, they already have. The Amazon Echo Look is a new invention that provides you with your very own hands-free personal stylist. The concept is fairly simple and involves you standing in front of the device with your chosen outfit on. The Echo Look will then take a full-length video or photograph, which makes you and your out the focus. You can then see whether you like the end result, and the Echo Look will learn more and more about your body and your style as time goes by. Kinda creepy, but kinda awesome. Going into a dressing room to try on clothes can be a highly stressful situation. The lighting highlights all of your lumps and bumps, the mirrors seem to make you look completely different, and you just have no idea if the clothes suit you or not. Most of the time, you either break down in tears or leave the fitting room in a strop because you just can’t make a decision. Well, these AI fitting rooms are putting an end to that. If you enter select Mango stores around the world, you can actually try these these AI mirrors yourself. They allow you to scan the items you are trying on to have another size delivered by staff on the shop floor, and you can even browse items that would complement such an item. 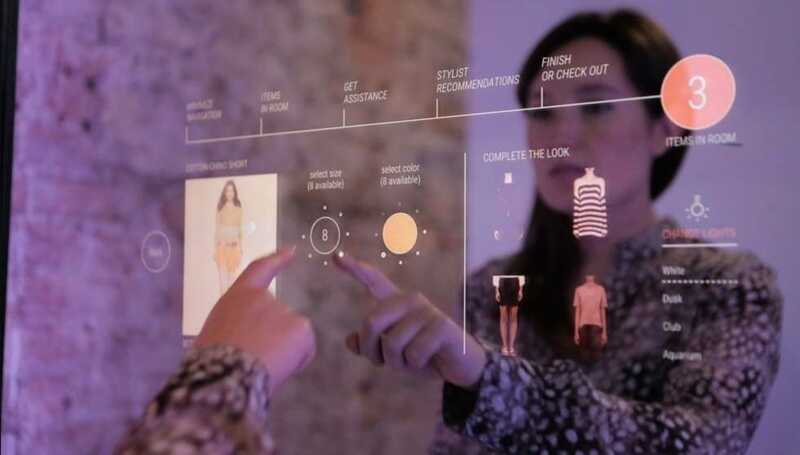 It seems as though more and more tech companies are trying to get their foot in the fitting room door with this technology, and it’s believed that it may be the future of artificial intelligence and fashion. Is it a match made in heaven? Or is it a fashion faux pas?